A new breakfast goodie, belVita! I saw these on the end display at my local Albertsons and decided to pick up a few boxes. I’m ashamed to admit it, but I’ve enjoyed Newton Fruit Thins for breakfast and thought the box of belVita Crackers looked healthier and purer. In case my mom is reading, relax, I am I taking care of myself. I eat the fruit thins with a banana and low-fat yogurt for breakfast. The belVita blueberry breakfast biscuits taste suspiciously like the blueberry Fruit Thins that I love. (http://flavorscientist.com/2011/12/08/newton-fruit-thins-blueberry-brown-sugar-review/). Belvita and Newton Fruit Thins are both manufactured by Kraft foods. Perhaps they both use the same blueberry flavor? They both use similar raw materials; but the belVita cracker has more whole grain, monounsaturated fat and nutrients (added B vitamins). The added B vitamins are probably why they call their product “Nutritious Sustained Energy”, although most nutrition advisors would probably push for high protein for sustained energy. I’ve tried all three flavors and found blueberry to be my favorite. There is a slight bitter aftertaste in the other flavors: golden oat and apple cinnamon. This bitterness is most pronounced in the golden oat flavor and it is my least favorite. Apple cinnamon is reminiscent of apple pie with butter flakey crust notes, it is my second favorite. Blueberry has a nice blueberry muffin lingering taste that I like. I love the crisp texture of these biscuits and find that they complement my morning latte and tea perfectly. In my last trip back to Albertsons, I found belVita biscuits in the cookie aisle (next to the graham crackers and mini Oreos). I can’t claim that these biscuits are extraordinarily healthy, but with my banana and yogurt, a decent breakfast. 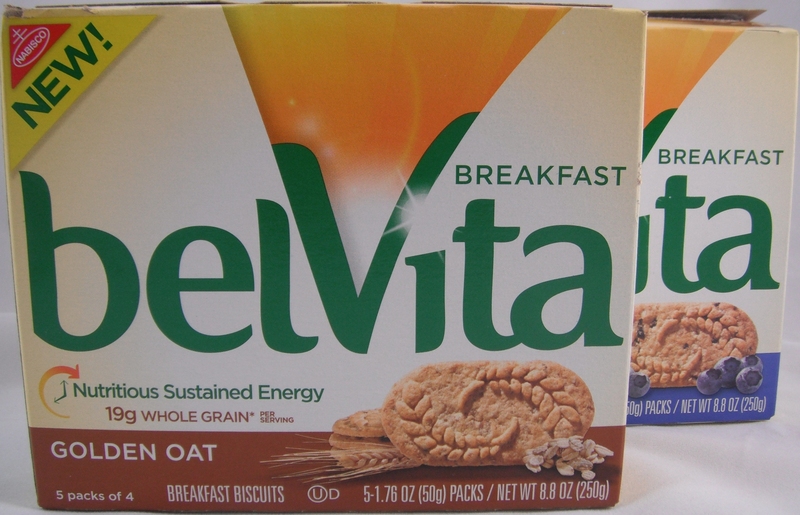 BelVita biscuits are an admirable product with impressive blueberry and apple cinnamon flavors. Shame on me for buying these without reading the ingredients. They are no more healthier than eating Oreo cookies for breakfast. They are laden with fat,sugar, and white flour; but because they have a few whole grains in them they’re called healthy. I had them for breakfast this morning and got an immediate sugar rush. Now I’m hungry again but feel horrible and still have that sugary taste in my mouth (like I just ate a big piece of frosted cake). It’s amazing that here in the US the food Nazis are confiscating turkey sandwiches from four year olds because according to the govt they’re “not a healthy lunch.” However, the govt turns a blind eye to these biscuits, which clearly are “not a healthy breakfast,” or a healthy food in general. Nabisco/Kraft and the FDA should be ashamed of themselves for allowing these to be called a healthy brakfast alternative. They should require a warning or disclaimer on every box. Per Serving: 230 Calories, 8g fat, 36g carbohydrate, 13g sugar. Nuff said, you may as well eat a cupcake. Hi Mike, I’m not certain what the manufacturer is claiming, but the box appears healthy and pure. I try to post nutritional and ingredient statements for products I review, because it is difficult to read labels entirely while grocery shopping with young children. 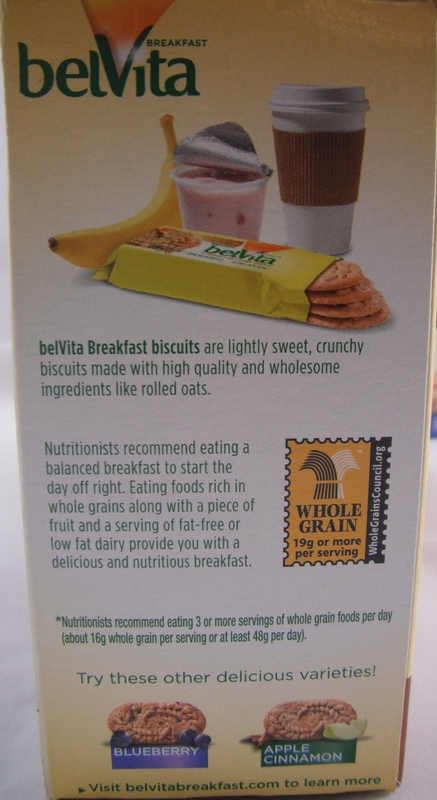 The biggest nutritional complaint I’ve read & heard about these biscuits is the low protein. Like you said, these biscuits are just like cookies for breakfast. There are many breakfast products on our market that have the same issue. I agree with most of what Mike A says, except for the end. An average frosted cupcake has 485 calories, 24g fat, 15g saturated fat, 63g carbohydrates, and 48g sugar. While these breakfast biscuits may not be good for your, it’s not fair to compare them to a cupcake, which they are nowhere near as bad. Don’t eat them and quit complaining. No one is forcing you to buy them. These are very tasty. They are also being misrepresentd as healty. Based on the Weight Watchers Points System, one biscuit is 6 points. Considering Weight Watchers points per meal suggestions, breakfast should be no more than 7 pionts. Trust me when I say, if I ate 1 biscuit with fruit, I would be very dissatisfied and would end the day over the daily points. These are definately not a good choice if you are on a healthy meal plan. I agree Jamie, probably not good food if you are dieting or maintaining your weight. A decent option, though, if this isn’t a consideration. There is nutrition (fiber & vitamins) in these biscuits. Jamie, don’t spread misinformation. 6 points is for a pack not one biscuit. Temptation to shout at you is high. These have just been introduced in Australia and I bought a packet for the first time last week. I am also a Weight Watcher, as is my daughter who can’t/won’t eat breakfast. Primarily I got these to encourage her, a biscuit with a cup of coffee followed by a piece of fruit was a compromise alternative. On the WW Pro Points system, one serve (50g or 4 biscuits) is 6 Pro Points. With a cup of coffee (zero points) and fruit (also zero) she is kick starting her day with food that, whilst not the best choice, is better than a stop at the local drive through on her way to work. These biscuits come in packs of 4 biscuits (one 50gm serve) with 6 serves in a box. I calculated the points on the WW calculator, and it is definately 6 points per serve (4 biscuits). With 30 points to ‘spend’ per day, using 6 to eat something at breakfast time is pretty economical. She won’t eat them every day, neither would I, we both like a change every so often, but in the rush to be out the door in the morning they are portable and a better alternative than Pop Tarts or the like! I agree with Rhonda. I wouldnt eat them every day but they are handy if you are on weight watchers and counting points. I find them good for a mid morning snack with a cup of tea but I only have 2 biscuits which is 3 points. I also find them good if you are travelling and need a snack rather than using a fast food outlet at the airport. I try to match my grams of fibre for grams of fat each day. At 3g fibre & 8g fat this is not a good start when breakfast is usually easy to get more fibre than fat. The lable says 8g fat is 12% RDI. Seriously who recommends 65g of fat a day? That may be reasonable for a manual worker exposed to the elements in winter but on a nutrition label this is definatly misleading. I don’t think I could eat 65g of fibre. I also limit added sugar intake & 11g is surprisingly high but not excessive for a processed meal. Thanks all for the comments. Actually, the USDA’s recommended daily allowance of fat for a 2,000 calorie diet, which is what all nutrition panel information is based on, is 44 to 77 grams, or 20 – 35% of your caloric intake. (It’s actually higher for children ages 4-18.) Manufacturers don’t get to make up the RDA on the nutrition panels, it’s regulated by the Food & Nutrition Board of the National Academy of Sciences. Fat is a nutrient, necessary as an energy source and helpful in absorbing certain vitamins, maintaining healthy skin and hair, controlling inflammation, blood clotting, and brain development. Of course, you want to consume primarily unsaturated fats. As for fiber, adult men are recommended to consume at least 38 grams of fiber, and adult women 30 grams of fiber (until age 60, when the number decreases). You actually DO need more fat than fiber. Bottom line: While these crackers may not be a perfect breakfast substitute, they’re not bad for an occasional on-the-go meal, especially if you also grab a piece of fruit. They are surprisingly filling – I usually consume a large breakfast and when I was running late I was satisfied until lunchtime with one serving of the blueberry belVita. I tried and like them a whole lot. They give me energy like no other product. It is interesting because I have been taking supplements for over 20 years and get so much energy from these. It made me search to see if caffeine or some other stimulant was added, which is not. I can eat one or two and it keeps me going for hours. I will continue to purchase them for this benefit alone. It is not a sugar rush, I know the difference. I eat them with a healthy breakfast. I bought two boxes of these. One apple and one blueberry, both were pretty delish. I must add that with diet, an exercise regimen is also suggested so any fat or sugar intake would be food for energy and fiber is known to be a sustained energy. Plus, compared to other breakfast options, two hundred and some calories is a pretty amazing option.